Thanksgiving has always, always been my favorite holiday. It’s one of the few that’s not steeped in religion, that’s not hyped with commercialism. Thanksgiving is just about good people coming together, and good food on the table, and stopping to give a little gratitude. Of course it’s my favorite! But as a vegan, Thanksgiving – as most people celebrate it – can also be difficult. It can be a sad season, for sure. This year I’m looking forward to exploring some of these issues here on Bonzai, and this, my friends, is a spectacular place to start. and feathered friends must fly! so instead we’ll dig in the dirt! I’ve read this to Waits over and over, and he just adores it. The rhymes are clever, the message is subtle and sweet and totally positive, and the whole thing reads like a true celebration of compassion. 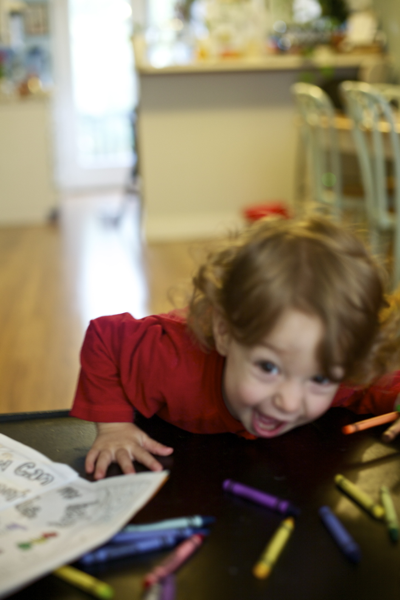 Plus, you know, COLORING! So fun. My little turkey . 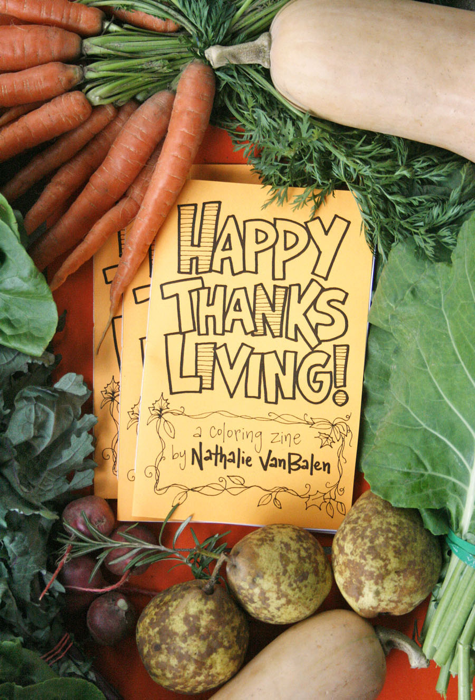 . .
You can order your copy of Happy Thanksliving here, and I really hope that you will! You’ll be supporting an incredible self-funded artist and an all-around wonderful lady. And of course, you’ll also be helping to spread a message of compassion for this holiday season! What a great idea! I’ve always loved Thanksgiving too, but since I’ve been vegetarian, it’s been hard because people look at you funny when you say you don’t eat turkey. Your poem is great! This is awesome (and the pics of Waits eating the book are just squeal worthy) Thanksgiving isn’t celebrated here, but I totally dig the ideas behind the colouring book and the juice book – I’m buying the juice book right now for my niece :) Love love love it! 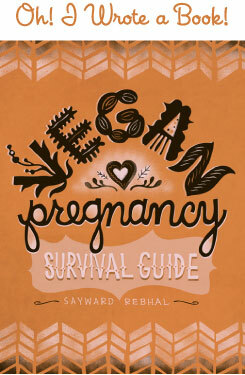 I’m very close to my 6 month veganiversary and I’m a little nervous for my first big family holiday. This little book just makes me smile! At a time of year that can be depressing, it’s nice to see Nathalie’s happy and celebratory pictures and thoughts! Ha ha ha…that first picture of Waits makes him look like a character on Modern Family, giving side commentary. 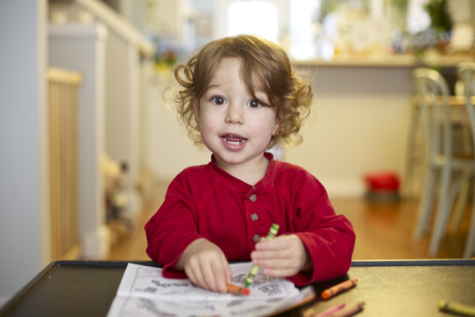 So cute…looks so grown up! Soo cute! 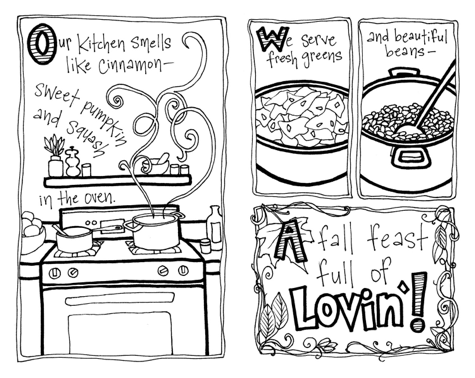 This is going to be my first vegan thanksgiving, as well as my kids’, and I’ve been a little stumped on what to do. This would be helpful for my daughter I think! Everyone else we know (including her dad) is in the throes of hunting fever so she’s started to say things about “shooting bucks” and “eating venison”…I have NO idea what I should be saying or doing about all of this! :S I don’t want her to feel caught in a tug-of-war about this issue, but at the same time I don’t want *them* to be brainwashing her! Thanksgiving has always been my favorite holiday too. No gifts to worry about, just food and family – perfect! This year since I’m trying out gluten-free and more raw diet I’m thinking I’ll make a raw brussels sprouts salad, one of the gluten-free “stuffings” featured in this week’s New York Times, and a gluten-free pumpkin-date bread pudding (like the one yesterday on Choosing Raw, but with pumpkin). Oh, now I’m hungry and want to get to the kitchen! Waits is adorable! I just heard about this on the Our hen House podcast from last week and I think the idea is incredible and powerful for children and adults alike. 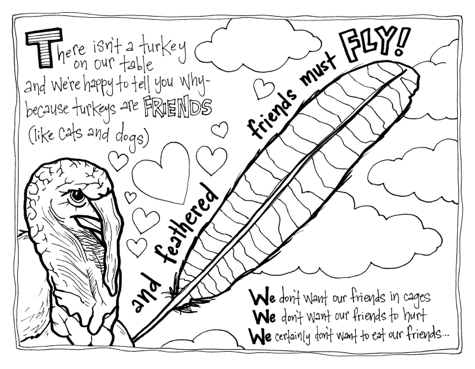 I think for vegans it’s a great reminder that our Thanksgiving should be about compassion that shines through when we turn down the turkey (and make it known why) and for non-vegans to incorporate some compassionate thinking into their holidays. I lOve it! What a cute book! I’m tempted to buy one a d my baby is still in my uterus! Haha! How adorable is that? My only problem is I would want to make sure Lincoln coloured within the lines, which is not likely at his age :) I guess someone could always buy two – one for him and one for me :) We have already celebrated Thanksgiving here in Canada but since we are still reading Halloween books I doubt he would care! Aw, well you could always save it for future years! Oof, I totally hear you. It can be really tough to express your own beliefs, while not “demonizing” others, when you’re trying to use age-appropriate language for children. I think a great approach is the “everyone is unique” comparative method. Like, “some people go to churches, some people go to synagogues, some people go to mosques” . . . “some people have a mommy and daddy, some people have just a mommy, some people have two daddies” . . . “some people don’t eat pork (religious), some people don’t eat gluten (allergy), some people don’t eat any animals (ethical)”, and then follow with a gentle explanation of why *you* choose not to eat animals. I know, probably easier said than done. You have my sympathies! Also – I think this is my first comment here – just wanted to say thank you for all the time you take to create this blog and share what you know – since becoming a reader here, I’ve learned to make alt milk, yogurt, cook easy vegan dinners, and all sorts of things. I’m drinking a smoothie with a calcium/magnesium/zinc vitamin ground up to “fortify” it – per your great idea. Thank you again! Thanks for the recommendation on the coloring book, it is so very nice to support self funded artists. The good: I wonder why I never knew Doctor Who was such an AWESOME show? Makes me want to see it from the very start! I’ve been watching the 2005 version, and I absolutely LOVE it. The bad: NaNoWriMo fail… again. I am so behind schedule that there is no chance of catching up. But, no tears… I’ve been busy with other stuff. Some of) it worth it (school, work, baby) some not so much –albeit awesome–(like watching Doctor Who on netflix), but failing is not bad. You learn a lot, right?